Prefer the key limes. The small one with a pale green skin. 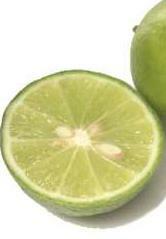 They are also known as Mexican limes. Use a hand-juicer to extract all the juice (about 2 oz per lime). An old classic you can still find today, if you know where to look!